Allison has been with B-Boy Productions, Inc. since 2014. While relatively new to the B-Boy staff, her violin experience is vast. 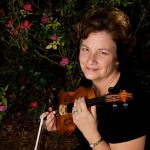 With a degree in performance from Temple University, she has lived and played professionally along the Gulf Coast since 1994. Not only can she play as a solo violinist, but she can also partner with other stringed instrumentalists to create trio and quartet options.